Greatness is a word used too often in boxing. For instance, Corrales vs. Castillo was a great fight, but are Corrales and Castillo great fighters? In my opinion, they showed elements of greatness in their epic war, but the true test of greatness entails that a fighter puts up great performances against great fighters over a long period of time. It remains to be seen how long Corrales and Castillo will last in this game, and whether either can be appropriately deemed great fighters by the end of their careers. Muhammad Ali crowned himself “The Greatest” early in his career, and he proved it over the long haul. He was the first three-time heavyweight champion, and defeated the best of heavyweights of the 1960s and 1970s in some of the most famous bouts in history. Ali also met the best heavyweight of the 1980s: Larry Holmes. Holmes was a former sparring partner for Ali, and it was a sad September night when the shell of Ali was dominated by Holmes. From that time on, Larry Holmes became a great fighter as well, but he suffered from a syndrome first manifested thirty years before Holmes defeated Ali: The Ezzard Charles Syndrome. When Ezzard Charles easily outboxed Joe Louis for the heavyweight crown in 1950, he was almost never forgiven for it. It simply didn’t matter how beautifully Charles feinted, countered, slipped, and jabbed. What mattered is that the public wanted a dynamic champion who transcended the sport, and Charles was too subtle and pure a sweet scientist to capture the public’s imagination. Born into poverty in Georgia on July 7, 1921, Charles’ family moved to Cincinnati, Ohio when he was a youngster. Ezzard Charles was almost a natural born fighter. As a teenager, Charles took up boxing and was undefeated as an amateur with a record of 42-0. Charles turned pro on March 15, 1940 as a middleweight with a third round knockout of Medley Johnson in Middletown, Pennsylvania. Fourteen months later, Charles had already compiled a record of 21-0 with 15 KOs. Like many of fighters of the 1940s, Charles was thrown in against experienced and accomplished opposition early in his career. In Charles’ twenty-second pro fight, he was matched with former middleweight champion Ken Overlin. Overlin was a veteran of 140 pro fights and fought a who’s who of the middleweight division since the 1930s. He outpointed the nineteen-year-old Charles over ten rounds in Charles’ hometown of Cincinnati. After losing to Overlin, Charles jumped right back into the fray. A few months after losing to Overlin, Charles won a ten round decision over former champion Teddy Yarosz, and then knocked out light heavyweight contender Anton Christoforidis on January 12, 1941. Six months before being knocked out by Charles, Christoforidis lost a fifteen round decision to future undisputed light heavyweight champion Gus Lesnevich. Charles reputation was growing, and even though he was experiencing difficulty making the 160 pound limit, some were wondering if the precocious star would land a title shot in the near future. In 1942, all questions about Charles’ prowess were answered. The Cincinnati Cobra was matched in back-to-back bouts with the great Charley Burley. Burley was feared, avoided, and revered during his career. Burley made a habit of beating bigger men, and he was the pure acid test for the young superstar. Both of the Burley vs. Charles bouts occurred in Burley’s hometown of Pittsburgh. The first bout occurred on May 25, 1942. The second bout was on June 29, 1942. Burley was a 3½ to 1 favorite for the first bout. The twenty-four-year-old Burley was a veteran of almost sixty fights at the time they met, and was on a twenty bout winning streak. Charles scaled 161½ pounds, and Burley weighed 155. The bout occurred on the undercard of Fritzie Zivic’s ruthless tenth round stoppage of former lightweight champion Lew Jenkins. “Charles started out by staggering Burley with a right to the mouth in the opening session, and although the second was even, Burley didn’t take a round until the fifth. Charles smashed home two hard left hooks in the bristling fourth that had Burley hanging on. “In the fifth and six (sic) Burley went to work and cut inside of his opponent’s mouth, but was just about finished after that. Ezzard came back to belt Burley dizzy with right across (sic) and a right uppercut in the seventh, and Charley was in plenty of trouble. Charles won a huge ovation from Burley’s hometown crowd. Rosenfeld reported that Charles was elevated to the number three slot in the middleweight rankings while Burley dropped to fourth. Charles became the number one middleweight contender for a short time thereafter, and actually tried unsuccessfully to secure a title fight with Tony Zale. Zale, however, ended up serving our country in WWII, and the bout never materialized. Charles moved to the light heavyweight division in late 1942, and fought three of Cleveland’s best light heavyweights in four months. On December 1, 1942 Charles distinguished himself with a ten round unanimous decision over Joey Maxim in Maxim’s hometown despite giving away eighteen pounds. Charles dropped a decision to another superb Cleveland craftsman, Jimmy Bivins, in his next bout on January 7, 1943. In his last bout before entering military service, Charles was dominated and stopped for the first time in his thirty-eight-bout career when Lloyd Marshall dropped him eight times in route to an eighth round stoppage. Charles was inactive in 1944 and 1945 due to WWII. During Charles’ WWII stint, rumors circulated that Charles flattened Billy Conn while both were in the Army, but Charles gentlemanly denied that he and Conn ever met in the ring. Charles returned to the light heavyweight division with a vengeance in 1946. By all accounts, Charles was the best light heavyweight in the world after returning to action. Many historians rank him as the best light heavyweight in history, despite the fact that he was never able to gain a shot at the world light heavyweight title. Over the years, Charles’ ranking as the best light heavyweight of all time has been met with skepticism, but his accomplishments are stunning. Charles avenged his defeat to Marshall with two knockout wins in 1946 and 1947. Charles swept three return bouts with Jimmy Bivins from 1946-1948. In the same time frame, Charles dominated Archie Moore in a three bout series, and knocked him out in their rubber match. Ezzard Charles defeated every light heavyweight he faced in an era of great fighters. More amazingly, from 1946 until mid-1951, Charles participated in 40 bouts, and would only lose once. On July 25, 1947 Charles gave away twenty pounds in a split decision loss to heavyweight contender Elmer “Violent” Ray. Charles avenged that defeat by knocking Ray out in nine rounds the following year. Unable to secure a title shot as a light heavyweight, Charles began campaigning as a heavyweight on a full-time basis in the late 1940s. On June 22, 1949, he decisioned Jersey Joe Walcott for the first time over fifteen rounds for the vacant National Boxing Association World Heavyweight Title. Charles would defend the title three times in the next fourteen months before facing Joe Louis for the undisputed heavyweight title on September 27, 1950 at Yankee Stadium. Charles weighed 184½, while Louis tipped the scales at 218. Charles easily defeated the slow and aging Louis over fifteen methodical rounds. The scorecards read 10-5, 13-2 and 12-3. Tape of the fight reveals that the scorecards were accurate, but more importantly, Charles didn’t win spectacularly. Louis was stunned a few times in the bout, but was never in serious danger. 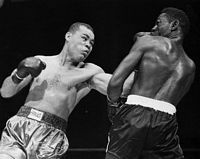 Succeeding the great, but over-the-hill Joe Louis was a huge accomplishment for a former #1 middleweight contender, but the public was looking for a more colorful, dominating presence in the ring. Like Charley Burley, Ezzard Charles was a pure sweet scientist. He was so proficient in the art that the untrained eye couldn’t appreciate the subtle brilliance of his performances. Thus, it was only inevitable that that Charles would flirt with obscurity. Indeed, Charles proved to be an unpopular champion. He was variously described as a blown up light heavyweight and a dull fighter. He successfully defended his title four times, but fans actually yearned for yesteryear as Charles carefully dissected his challengers. When Charles lost his title in 1951 to the man he previously defeated twice, Jersey Joe Walcott, it marked a more significant moment in boxing history than when Charles assumed the throne from Louis. Walcott became the oldest man to win the heavyweight title. After losing the title to Walcott, Charles unsuccessfully attempted to regain the heavyweight title three times. He lost a fifteen round decision to Walcott in 1952. In 1954, Charles lost a tough fifteen round decision to Rocky Marciano, and was stopped in the eighth round by The Rock three months later. Even far past his prime, Charles gave Marciano his toughest fights. He nearly regained the title in their second bout when Marciano suffered a severely split nose, and was on the brink of defeat when he stormed back to take Charles out in the eighth round. Like many great champions who go on too long, Charles faded into obscurity after his last title shot against Marciano. From 1955 until his retirement in 1959, Charles would fight twenty four times, and only win ten of those bouts. Indeed, the last four years of Charles’ career severely diluted his final record. Charles’ final ledger reads 96-25-1 (58 KOs). Several years after his retirement, Charles became afflicted with lateral sclerosis, and was paralyzed from the waist down. He was inducted into the Hall of Fame in 1970. Ezzard Charles died at the age of 53 in Chicago on May 27, 1975. 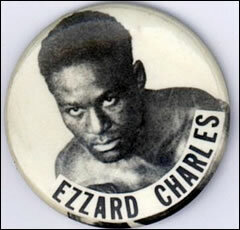 Ezzard Charles is, in my opinion, among the top five fighters of the 1940s and 1950s. This is an especially high compliment, because I believe the sport peaked in these two decades, relative to boxing technique and depth of talent. 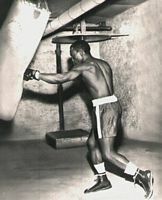 Charles was the #1 middleweight contender in the early 1940s. He beat all of the best light heavyweights of his era. He dominated two of the greatest fighters of all-time: Charley Burley and Archie Moore. When Charles was past his prime, he gave the only undefeated heavyweight champion, Rocky Marciano, his toughest fights. More intriguing is the notion that Charles might’ve held back in some of his most noteworthy bouts. On February 20, 1948 Ezzard Charles knocked out Sam Baroudi in the tenth round of their light heavyweight bout in Chicago. Baroudi died from injuries sustained in the bout, and many believe Charles was overly cautious thereafter. The impact of Baroudi’s death on Charles’ psyche might explain why he was less than dynamic when he became a heavyweight champion. Ezzard Charles was too great for his own good. This article appears at Cox's Corner with permission of the author.